Beautifully engraved Gold Bond Specimen certificate from Yolo Water and Power Company dated 1912. This historic document was printed by Franklin-Lee Bank Note Company and has an ornate border around it with a vignette of three allegorical figures and is over 96 years old. In 1914 the Yolo Water and Power Company completed a concrete dam across the outlet of Clear Lake that feeds into Cache Creek, improving storage capacity for flood control and irrigation downstream. 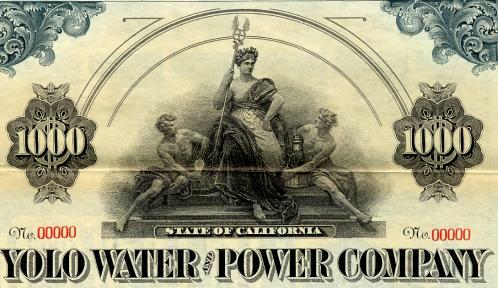 The Yolo Water and Power Company became the public Water Conservation District. 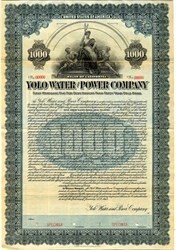 Yolo Water and Power Company became the Clear Lake Water Company. In 1957, the Yolo County Flood Control and Water Conservation District was established. The district acquired the Clear Lake Water Company in 1967 and in 1976 it built the dam forming the Indian Valley Reservoir on the North Fork of Cache Creek. "Clear Lake water" is what the local Yolo farmers call this life blood of their livelihood, and much of it flows out of Cache Creek at the inflatable Capay Dam, to the southeast via the Winters Canal and to the northeast via the West Adams and Hungry Hollow Canals. By 1987, this water was irrigating 55,000 acres of Yolo farmland.